A core component of the American Legion is helping other veterans, our community, and our youth. 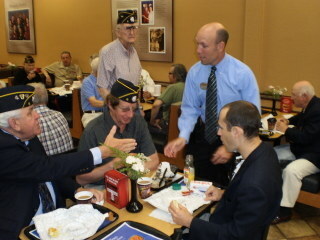 We reach out to help others and work with other veterans groups to fund assistance from various veterans’ relief funds. How do we find out that someone needs help? We talk a lot, but we mostly listen. We talk to people we meet on the street, at shopping malls, doctor’s offices, service centers, retirement residences, and senior centers. We listen for clues as to how we might be of better service to our veterans. We listen for special needs, financial issues, health concerns, schools, Americanism-related community efforts and needs, and more. If we can match one of the many services offered by the American Legion or Department of Veterans Affairs, we share our knowledge. What we don’t know, we offer information on where they may get help. Did you know that a lot of veterans do not even consider themselves as a Veteran? Some think that Veterans belong to the American Legion or some other organized veterans group. This is not the case. Any person who has served his or her country in a military force is a veteran. To belong to the American Legion they would have had to serve during a period of wartime. We don’t help just Legionnaires. We help veterans. So, if you are a veteran or know of a veteran in need of help, give us a call. We have a special line for you to use. Call 919-442-8130. It’s a direct line to our Post Commander.